Out of everything I’ve seen him in, I like to imagine Armando was the character most like Ricardo Montalbán in real life. You see, I took a small interest in Mr. Montalbán’s off-screen doings when in 2002, just after my return to The Church, he received the first annual Spirit of Angelus Award, an honor given “for a body of film work of surpassing quality complemented by a faith lived with integrity and generosity.” At his acceptance speech, he noted that his Catholic faith was the most important thing in his life, followed closely by his marriage. It wasn’t just talk. He remained happily married to actress Georgiana Young for 63 years (63 YEARS!) until her passing in late 2007. On the Church side, in 1998, he was recommended by his Bishop for membership as a Knight in the Order of St. Gregory the Great, an award given by the Vatican to acknowledge an individual's particular meritorious service to the Church. Read it all over at The B-Movie Catechism. 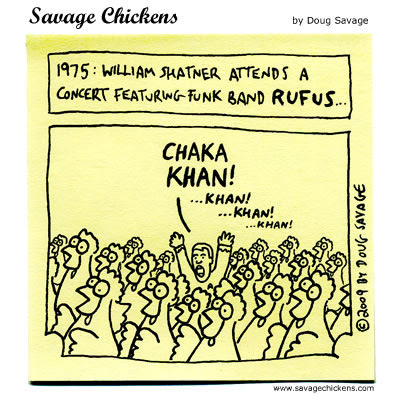 How appropriate this cartoon from Savage Chickens is, after the commentary in the comments box about The Wrath of Khan.